Honour the animals that have served & protected members of Australia’s Armed Forces by buying a purple poppy at the Dog Lovers Show. 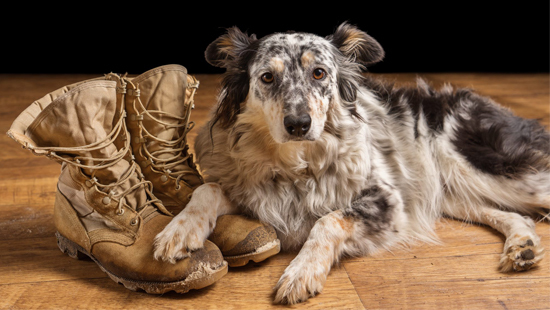 Throughout our nation’s history, in theatres of combat and in peacetime, animals have served and protected members of Australia’s Armed Forces both here and around the world. It is estimated more than 400,000 Walers [an Australian breed of riding horse originally called ‘New South Walers’] left our shores used as beasts of burden or as cavalry mounts. In WWI, the Allies used 20,000 Dogs in the war effort. Being sure-footed, Dogs were able to run through the mud and craters of ‘No Man’s Land’. As they were smaller and faster than humans, snipers found Dogs more difficult to shoot. More than 1,500 Dogs were used during the Korean War. In the Vietnam War, Dogs became an invaluable asset to Australian soldiers. Sadly, due to policy and quarantine regulations, all serving Australian Dogs were left behind for the enemy when orders were given to withdraw. This is still an emotive issue for many Vietnam veterans. It wasn’t until 1993 that Aussie war Dogs came home from Somalia, the first time in our nation’s war history. A variety of animals, from insects to camels, carrier pigeons, mules and donkeys contributed in varying ways to the war effort. 200,000 pigeons performed messenger missions during World War I and II and suffered huge losses.